Courageous is a beautiful, sweet girl that is very friendly. She is laid back and well behaved. She is just retiring from her life as a mom and had one litter of pups more than a year ago. She was a fantastic mom and chose to spend an entire year raising her pups. They finally had to separate them when the pups went off to race training and she missed them so much. She travels well and just laid down in the car on the trip up from Florida most of the way. She did come up every now and then to check in and get petted. She did fine with two smaller dogs she has met so far so seems like she will be OK with them. She needs to be cat tested. 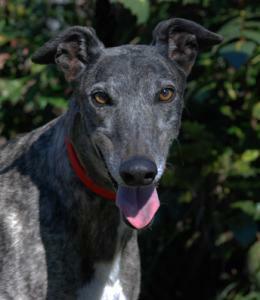 Courageous is a grinner and will do the famous greyhound smile for you when she is happy. There was a lake on the farm where she has lived and she reportedly loves water and likes to swim. More as we get to know her.